Welcome to onewomanstudio. A great place to shop for one-of-a-kind upcycled and eco-friendly tote bags, home goods, and fashion. 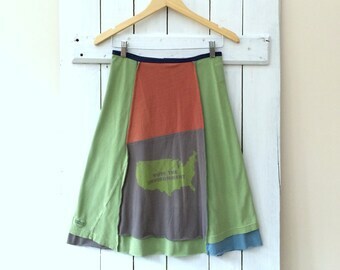 Handmade in Maine since 2004.
onewomanstudio is a tiny design and sewing studio nestled in the woods of downeast Maine. My philosophy is simple: Be good! To yourself, to others, and to the earth. Recycled, rescued, and repurposed materials - either wholly or in part - are incorporated into all of my creations. 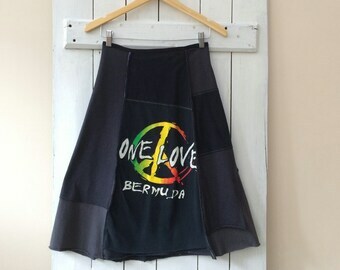 Each design is a onewomanstudio original, and each item is unique! All of my items are thoughtfully designed, expertly crafted, and built to last. I pride myself on the craftsmanship of cutting and sewing each piece by hand, using the simplest of tools: scissors, pins, tape measure, and a trio of vintage sewing machines. Thank you for stopping by! I hope you find something you love! Please visit my other Etsy shop, OWSvintage, for vintage and antique items and a little bit of kitsch! This bag is so beautiful! I love it! Very bright and colorful, I love the thick strap and all of the pockets. 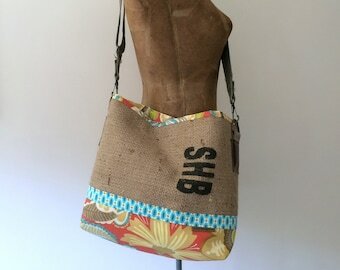 I love the rustic look of the burlap paired with this bright fun fabric. Very well made! Thank you so much!!!!! Doing a little spring cleaning in my Etsy shop! Lucky you! Me and Ol' White working on something new for the shop! 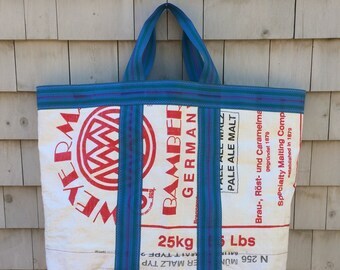 Great, big totes made from grain sacks from a local beer brewery. Repurposd, eco friendly, and ready for whatever you need to load them up with. More color combos coming soon! One of my four(!) vintage sewing machines. This one's my work-horse. 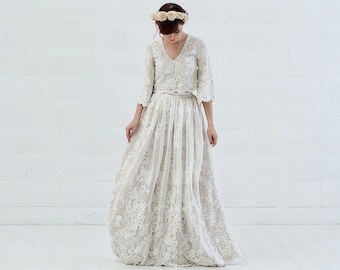 onewomanstudio's newly opened retail shop! Hidden in the heart of downtown Ellsworth, Maine at 192 Main St.
Late 2015 saw the introduction of the first pieces in my new line of clothing, made exclusively from upcycled t-shirts. Tote bags made from repurposed burlap coffee bean bags and salvaged fabric. When I'm not sewing I like to get outside! Here I am at the top of Cadillac Mt. in Acadia National Park. Hello. I'm Julia, the one woman behind onewomanstudio! As the name implies, I do it all: hunting and gathering the materials for my creations, designing, sewing, product photos, shipping, vending... The list seems endless sometimes. But I truly love what I'm doing and am very proud of the fact that I can support myself with my craft while also saving a whole bunch of 'trash' from entering the waste stream. Yay! onewomanstudio is a tiny design and crafting studio, nestled in a corner of the Maine woods. And I'm Julia, the one-woman designer and maker of all things funky, functional, and fabulous at onewomanstudio! All of my items are thoughtfully designed, expertly crafted, and built to last. 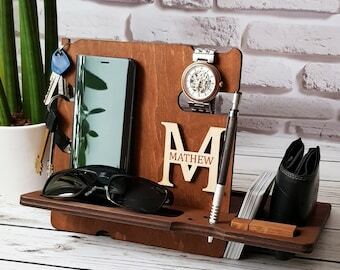 I use recycled, reclaimed, and repurposed materials - either wholly or in part - in all of my designs, going out of my way not to use any virgin materials except where the design and product strictly calls for it. Since making my very first tote bag in 2004, onewomanstudio has been 100% Maine made and uses 100% Maine sourced recycled materials. * Please read the details of each listing before buying. If you have any questions about size, materials, etc. please feel free to ask. * Exchanges may be made if I am contacted within 3 days of receipt. Items must be unused and undamaged. Shipping cost will not be refunded. Buyer is responsible for return shipping. * No exchanges on custom or reserved listings. Payment is accepted via Etsy's Direct Checkout (credit card, debit card) or PayPal. All major credit cards are accepted using either method. Etsy Gift Cards are also happily accepted! Your purchase will be shipped 1-3 days after order is received. Insurance of up to $100 ($50 when shipped USPS First Class) of item value is included on domestic orders. If you wish to purchase additional insurance or insurance for an international order, please contact me. onewomanstudio is not responsible for lost or damaged packages. Recycling is what I do! 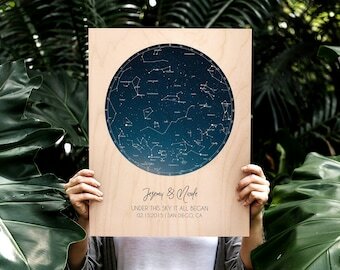 Custom and wholesale orders will be happily considered!